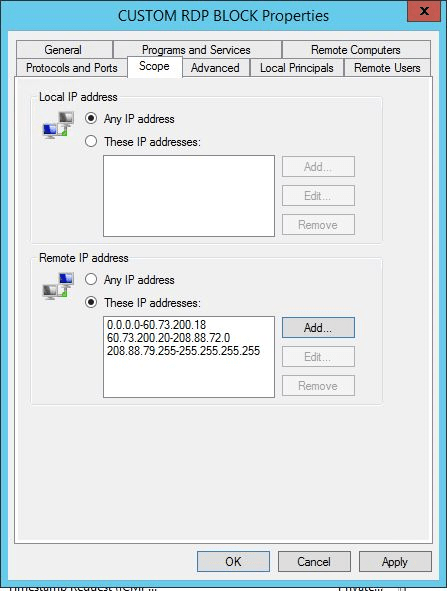 You can restrict Remote Desktop access to your server either with an IP address or range of IP addresses using windows firewall, following the instructions below. 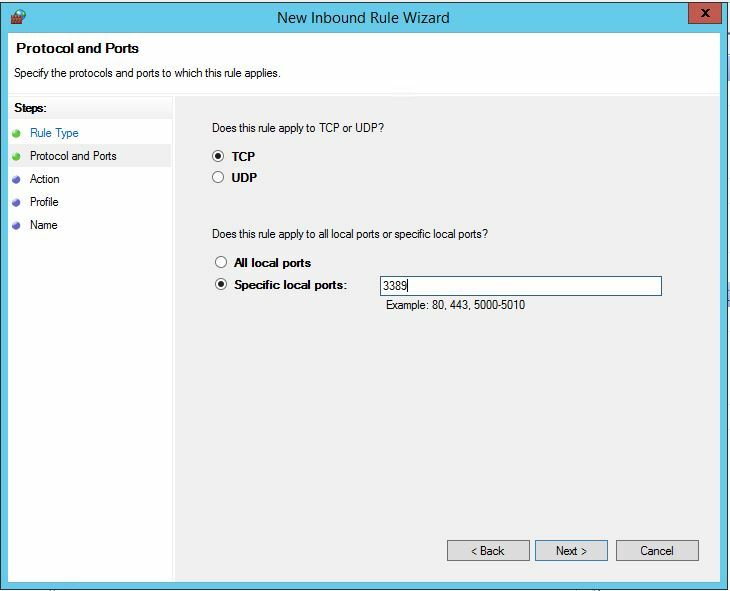 To maintain your existing Remote Desktop connection to the server an Allow rule needs to be created first, and the IP restriction rules added. 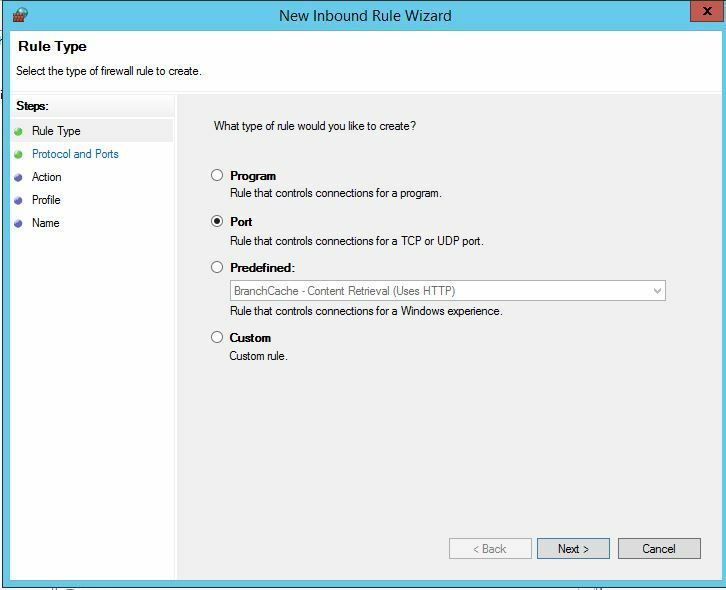 Once these have been created the rule will then be switched to block all IPs specified in your restriction rules. In the Actions menu click on New Rule. 9. On the Profile screen leave Domain, Private and Public checked and click Next. 10. On the Name screen give your new rule a name such as “CUSTOM RDP BLOCK”. The new firewall rule has now been created and the IP restrictions need to be added. 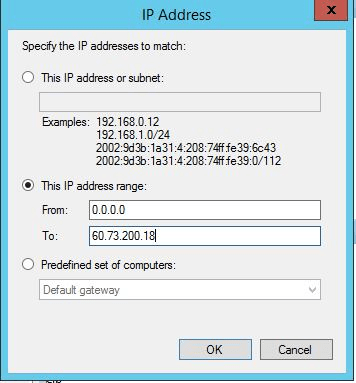 Under the Remote IP address section select the These IP addresses option. Select either This IP address or you can use a range. If range is selected Enter your range into the from and To boxes. 7. Add IP ranges to allow all the IPs required. 8. When all your IP addresses/ ranges are entered click the OK button. Your IP Restriction rules are now in place to allow all IP addresses outside of the addresses / ranges that were added. The Firewall rule now needs to be switched from Allow to Block. Right Click on your Firewall rule and select properties. On the General tab under the Action switch the radio button from Allow the connection to Block the connection. If you are still connected to the server via Remote Desktop after switching the Firewall rule to Block the connection your rule is working correctly. Accidentally deleted the remote IP addresses added. When applied for “Any IP address” option and switched back to the manual entries all went deleted. Is there any scope to retrieve the whole list??? Sorry to say there is nowhere to retrieve this, you will have to enter the list or scope of ips again. One thing I do is stick the IP’s in a notepad document then you have a reference to fall back to just encase some thing like this happens again. Works like a charm. it worked for both windows 2008 and 2016 servers. Thank you very much for your great help. Thanks for the comment, glad i could help… This works on anything that has the advanced windows firewall feature which is Windows 2008 r2 and above. Hemp, I’m guessing the same thing will work for the Windows FTP Server – but would I need to specify any ports other than 21? This should work for any port on a Windows PC. If its just a standard windows FTP then just opening port 21 should be enough.